When SageTV 7 first arrived to public beta a few months ago I mentioned several 3rd party projects underway that would be coming to SageTV 7 users. Three projects in particular are particularly interesting. SageTV My Movies is in public beta now, Project Ortus has given us several previews of what’s to come from them and we are just now getting more information about Project Phoenix. Project Phoenix – Yet another combination UI system and feature-set add-on being developed by a team of developers for SageTV. This one includes developers of the well-loved SageMC add-on. SageTV MyMovies – Ever heard of MyMovies? This add-on is a port of MyMovies and it’s available now in beta! I’m hoping to get a first look at Phoenix before it’s released along with more information so stay tuned to GeekTonic for more information. Where does Mrs. GeekTonic find all of the books she needs for her eReader? There are many sites to search for your next book including the sites where you are actually going to buy them (i.e. 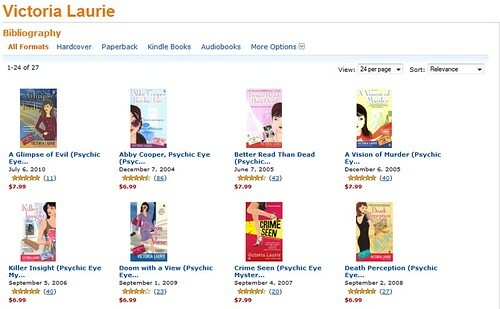 Amazon for the Kindle and Barnes & Noble for the Nook). Unfortunately, I have found that for me Amazon doesn't always have the information that I need to help me determine which book should be next on my list. As previously mentioned in guest posts, I read for pure relaxation. 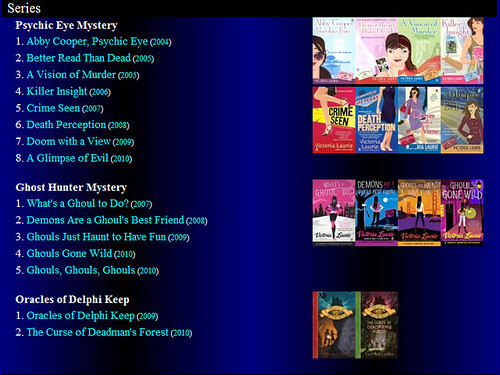 I read a genre labeled “cozy mysteries”. They are typically written in series with the same hero/heroine so it is very helpful to know which book comes next. My mother pointed me to a website from the UK that some of you are already familiar with: www.fantasticfiction.com. 1. The homepage for the author gives some basic info on the author to start. There is usually a picture, country or origin, birth and death years (if applicable) etc. 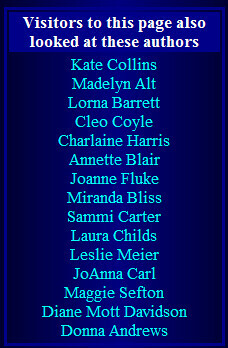 It also lists any pseudonyms that they have also written under (IE – Nora Roberts – JD Robb). Then they list the most recent books available for purchase (listing the Amazon prices only – I wonder if there was a Woot-esque merger somewhere along the way). 2. It puts series in order. 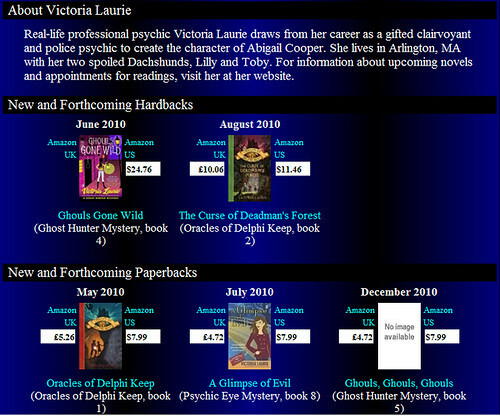 Below is an example from Victoria Laurie’s page. She currently is writing 3 separate series. Fantastic Fiction lists them in order and lists their publication date. 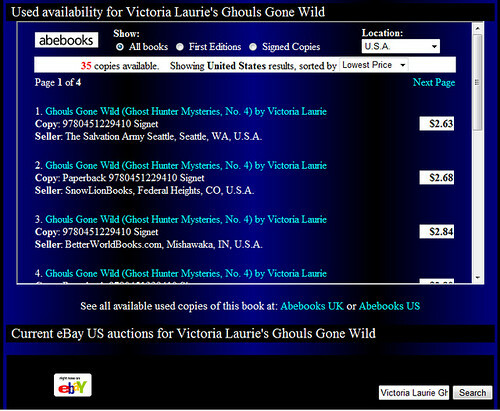 Below is a screen print of Victoria Laurie’s page from Amazon. Amazon allows you to sort, but not by series. The best you can do here is by publication date. From this view (above) you cannot even tell which number they are in the series. 3. Next on the homepage is a list of books published by other publishers or in conjunction with other authors and other information (aka the author’s websites, twitter, facebook fanpage etc). Seriously the only database I know with more information is IMDB. How they keep this thing up to date and accurate is amazing! 4. Next - Recommendations from the author. 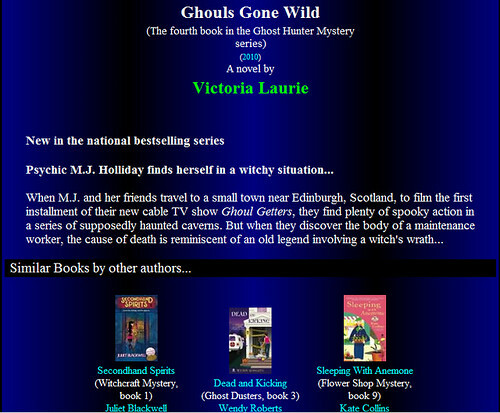 (I had to switch to another author because Ms. Laurie did not have any listed.) I have found some good books by reading what my favorite authors read. They may just be hawking one of their publisher’s other authors, but I usually research the book before I buy anyway. 5. 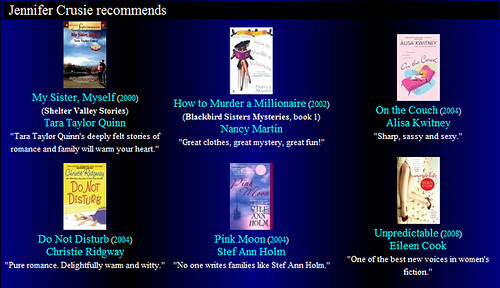 The site then recommends other authors that write in a similar style that you may like. I have found oodles of new authors this way. These will link you to the Fantastic Fiction homepages of the authors. Next on this page is a list of similar books that you may be interested in and then a list of places where you can purchase the book used (NOT Amazon). Then there are links to eBay auctions for the book as well. While I love this site for most of my authors, I do find it difficult to use for prolific authors like Nora Roberts, James Paterson etc. Especially when (like Nora Roberts) their publishers RE-release books that are not new, but are repackaging them with 2 other titles to make a group book. Hard to keep track of what I have read – Not that that is FF’s fault. Conclusion – Give www.fantasticfiction.com a look and see what you think and give me a comment or suggestion. If you have a site you think is better…. Let me know! Thanks to MrsGeekTonic for this review - I really appreciate her input and hope to see more guest posts on GeekTonic sometime in the near future – when she’s not teaching. If you have any questions about eBooks, eReaders such as the Nook or Kindle, Teaching technology or pretty much anything, feel free to ask in the comments below or follow her on Twitter. Back to School – Have You Ever Used a HTPC at College? Quick question for the readers: As I ran through the hundreds of “Back to School Guides” showing up in my RSS Feed Reader these last few days I began wondering how many of you used or are using a Home Theater PC – type device for TV, Movies, Music etc while at College. Anyone out there? Please let me know in the comments. A few weeks ago I picked up a high-performance 1.5 Terabyte Hard Drive to use as one of my two Home Theater PC (HTPC) recording drives. In the process I needed to remove one of the six drives in my HTPC. No problem right? Except for the fact this was a perfectly good 1TB Western Digital Green Drive. One that I needed to find a home for. 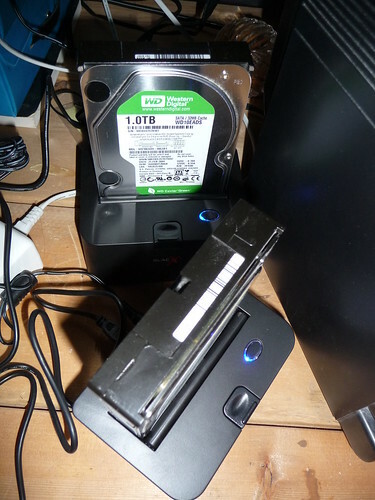 So I went on the hunt for a good hard drive enclosure to house the newly orphaned drive. Enter the Thermaltake BackX SATA Enclosure. 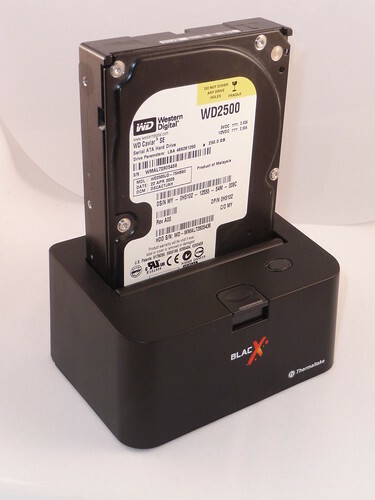 This enclosure gives you a simple way to take your SATA I or SATA II Hard Drive, and plug it into the enclosure like toast in a toaster (no it’s not that hot), plug the enclosure into the wall AC and connect it to your computer – or in my case to your PogoPlug via USB 2.0. And your hard drive is ready to use! Note: hard drive must be formatted before plugging into enclosure to work. 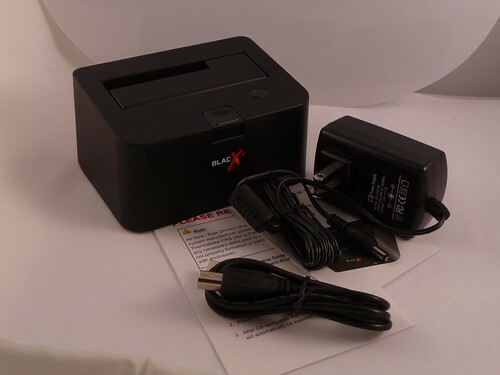 Transfer Rate: Up to 480 Mbps (Max) – this is of course what you get with USB 2.0, but plenty of speed for most video, music and photo files for your HTPC. Not ideal for recording for say a HTPC DVR however. For the moment I have two of these. One will be used for some video files and the other will be a backup for music and photos. All are connected to my PogoPlug and therefore all files are accessible by me over my home HTPC network as well as mobile via the MyPogoPlug website page and my iPhone. 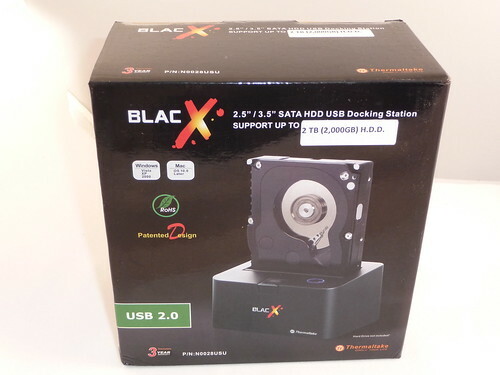 If you don’t need the speed of ESATA, this enclosure is a great option. It’s extremely easy to switch out drives – you just pop them in and eject the drive to remove it – it really does work like an old game machine cartridge (this reference is for those of you who actually remember the Atari and Colecovision game machines.) Another bonus is the ability to handle 2.5” and 3.5” drives which adds to its versatility. 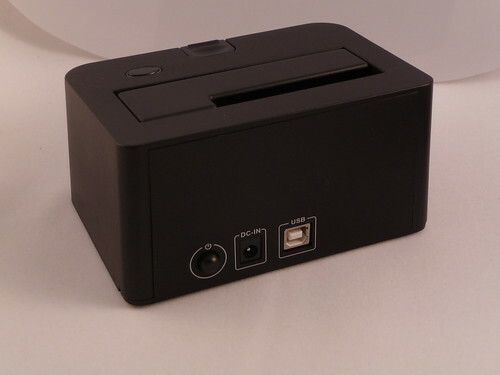 On the back of the enclosure you’ll find the USB port, AC port and a power switch. The enclosure shipped with a power cord, USB Cable and instructions. Although honestly the instructions weren’t really needed in my case – a good reference if you run into problems, but the setup was extremely easy. Inserting a drive involves a slight amount of force until it “clicks” into place. The drive is held tight in the enclosure which is a good thing. 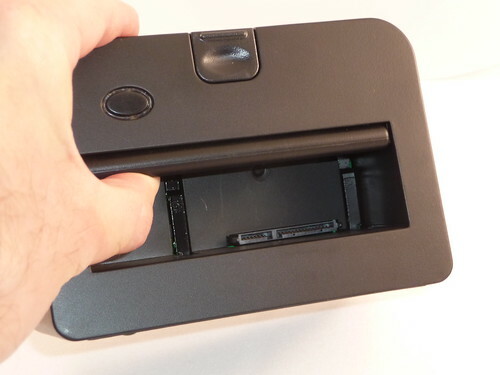 Removing the drive from the enclosure requires you to push firmly on the “eject” button on the enclosure – this requires a bit of force as well but it’s easy to do. 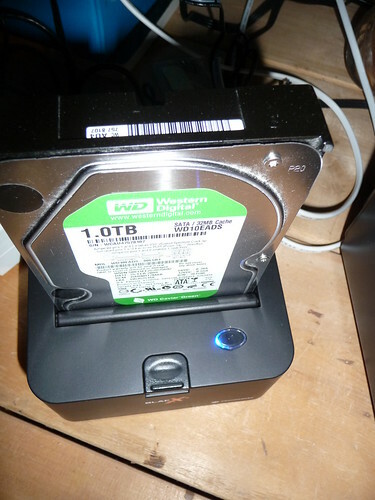 I tested the enclosure with several Western Digital drives and a Seagate drive and each of them worked perfectly so no obvious compatibility issues. After a few days of use the hard drives kept relatively cool inside the enclosure – of course much of the hard drive is showing outside of the enclosure so there’s more air flow there than inside a computer in most cases. The two enclosures are living in my gadget laboratory, but working hard behind the scenes thanks to my trusty PogoPlug. You’ll note the blue-LED lighting that emanates from the enclosure when it’s powered on. Ben Drawbaugh of Engadget HD fame has posted a how-to guide that Home Theater PC (HTPC) enthusiasts should put on their must-read list. If you use a HTPC such as SageTV or Windows MediaCenter you’ve probably heard of Comskip and ShowAnalyzer – the two most popular (and best) commercial skipping applications on the market. 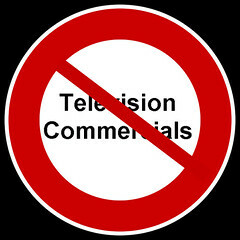 Well Ben has the ultimate guide to tweaking ShowAnalyzer so that it detects commercials as accurately as possible. The latest ShowAnalyzer beta allows you to set rules to tweak the settings per channel or even per show. Ben’s guide requires that you roll up your sleeves and delve into the inner workings of ShowAnalyzer, but it’s an endeavor that will be well worth your while. Each week GeekTonic covers the TV scene with a complete listing of premieres, finales and specials for the week. The only notable highlight in the bunch for me is the new series Rubicon which premieres on AMC. There’s a lot of other finales and premieres to so check out the complete list of new premieres and finales below. Rubicon (8pm on AMC – Available in HD) – A new drama on AMC based in NYC revolving around a conspiracy at a government intelligence agency. James Badge Dale portrays an analyst for a government intelligence agency with an eye for finding clues in everyday information that suggest sinister motives by unseen forces. Premieres with back-to-back episodes at 8pm and 9pm. Aftermath With William Shatner (10pm on Biography – Available in HD) – A new docu-drama series hosted by William Shatner. In this episode, Goetz, known as the Subway Vigilante talks of the day he shot four teens on the NY City subway. 18 to Life (9pm on CW – Available in HD) – New comedy series for CW – brought to the U.S. via Canada’s CBS Network. The series follows two 18-year old neighbors who get married on a dare. The two go on to prove that their love is real. Scrappers (10pm on SpikeTV) – New reality series where we follow a bunch of guys searching for scrap metal to recycle. What fun! The Nightlife (9:30pm on Teen Nickelodeon) – New teen entertainment series. First up Ice Cube, Aaron Fresh and New Boyz. No I don’t know who those last few entertainers are but I’m getting old too. Stan Lee’s Superhumans (10pm on History – Available in HD) – New reality series with the creator of Spider-Man and other comics. Lee goes on a journey to track down people with unusual abilities caused by genetic “differences.” So does this have anything to do with history? Probably not.